If you’re an Everton fan and want to watch the Mighty Blues at Goodison Park, get in touch and join our Supporter’s Club. We run a coach to all home games and – depending on demand – on a per-match basis to away games too. You don’t have to be a season ticket holder or a regular game attendee to join the Supporter’s Club. It doesn’t matter if you’ve never been to Goodison Park before or don’t know anything about how to buy tickets or where to sit. Our Supporter’s Club is a friendly, close-knit group of Everton fans of all ages. All new members will be welcomed into our club family and we can arrange for the purchase of tickets seated near existing members and provide friendly advice about the stadium and the facilities nearby. Our supporter’s club was founded in January 1996 and our number has since grown to over 50 members. 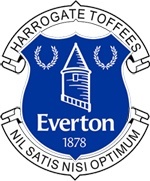 Membership for the Harrogate Toffees covering the 2016/2017 season is £15 for existing Everton season ticket holders and £20 for non-season ticket holders. Membership for children between the ages of 5 and 18 is free. Prices for transport to away games will be made available as applicable. Please note that prices are subject to change for next season following our annual costs/price review. We can also pick up at other locations along the way and are willing to consider any reasonable request to pick up on route; please contact us to discuss.